Get the most from your tone with this reinvented classic compressor. The Way Huge laboratory has resurrected the Saffron Squeeze Compressor, and it came back from the other side with a few new quirks! The MkII has all of the love honey sustain and dripping compression of its predecessor, but now you can shape and mold it just the way you like it. In addition to the MkI's Volume and Sustain controls, this revitalized rascal now has a Gain control to set the input gain level, a Tone control to cut post-compression high-end, and an Attack control to set the compressors reaction speed. 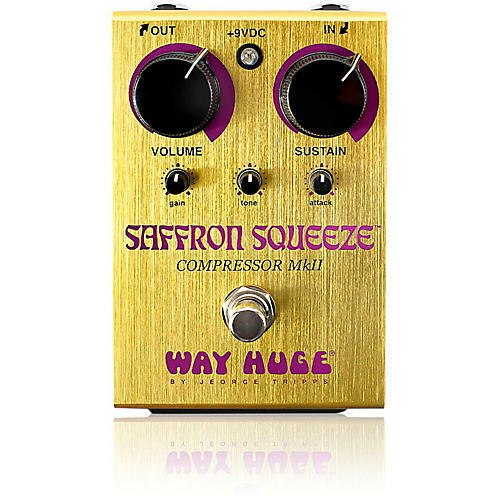 The Way Huge Saffron Squeeze MkII Compressor is TLC for your tone.